Creating a good environment in the dairy is key to an efficient milking. Cows are creatures of habit and they respond better if they have a routine that is consistent and predictable. While an unfamiliar feature of the dairy may initially provoke moderate fear, cows will learn to become familiar with that feature over time. If factors are constantly changing, a cow will not be able to adjust and the cow's sensitivity will be heightened, making the cow overly fearful of people or particular location or physical structure. Cows have good short-term and long-term memories and will readily learn a variety of tasks. This characteristic is one reason why cattle respond well to consistent handling routines. Strong physical or emotional experiences (good food, fear, pain) are likely to result in long lasting memories. Cattle learn to associate people or locations with rewarding or negative experiences. There are a number of factors that provoke fear in cows including: fear of heights; sudden movements and noises; threatening or aggressive actions; prolonged eye contact; and large or towering objects. 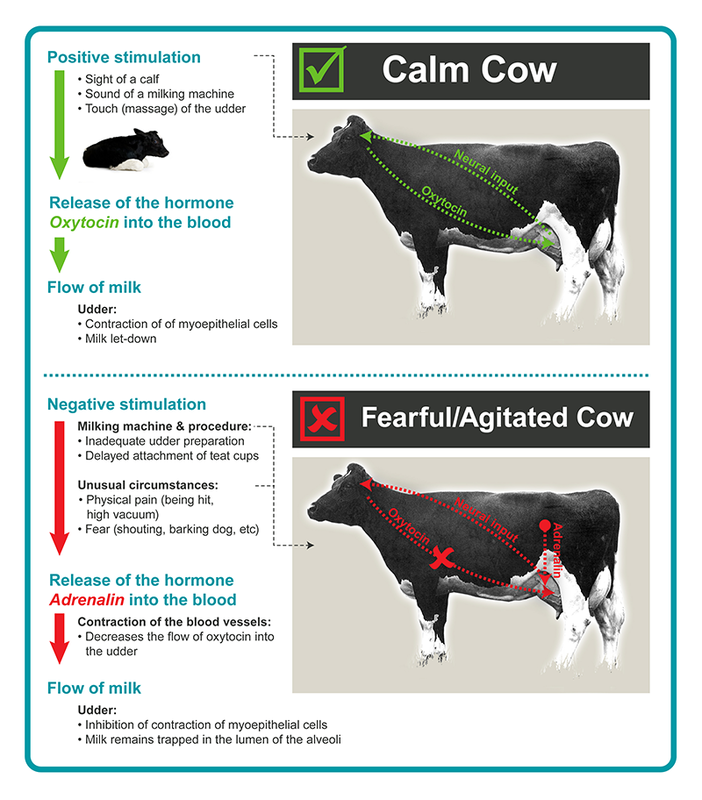 Fear responses should be minimised by appropriate handling behaviour and good dairy design. Handling becomes harder, more time consuming and more dangerous. Cows become more prone to injuries. Address welfare issues. Pain, stress and fear are all animal welfare issues and need to be avoided if possible. Not only are they ethically unacceptable, but also there are local community and international market expectations to meet. Fear causes the release of the hormone adrenaline into the blood stream causing a ‘fight or flight’ response. Adrenaline primes the body for action by increasing the heart rate and blood flow to the muscles. It also blocks the action of the milk ‘let-down’ hormone oxytocin. This effect can last up to 30 minutes from a single release of adrenaline. For more information on milk let down click here. Avoid hits, slaps and tail twists as they all provoke fear, even when they are not forceful. 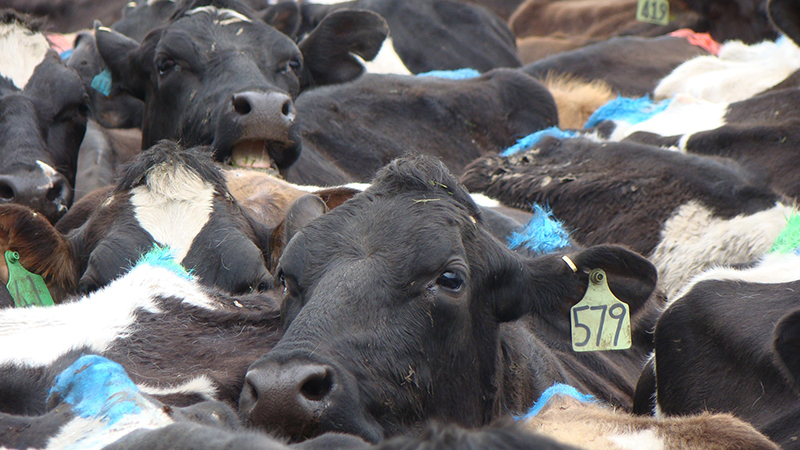 Research has shown that negative handling of heifers increases fear of humans and flight distances. Avoid sudden or unusual movements that will cause a fearful response. Avoid shouting or behaving in a threatening manner. Entering into the flight zone will provoke fear especially if the cow cannot move away. The degree of fear a cow experiences is intensified in an unfamiliar environment or circumstance. It is important to keep features such as lighting, floor surfaces or levels and fence or wall types as consistent as possible. Prevent painful milkings e.g. due to poor machine set up, incidences of mastitis or poor handling (e.g. hitting), and avoid painful procedures in the dairy at all times. Ensure milking machines are maintained and stray voltage is eliminated. Give some supplementary feed as a reward after bad experiences such as restraining or health related procedures. Keep the milking routine calm and consistent. This means that all milkers need to know the milking routine. It should be written down and communicated to any new milkers. Put bends on pipes to avoid cow injury and jammed wash down hoses. 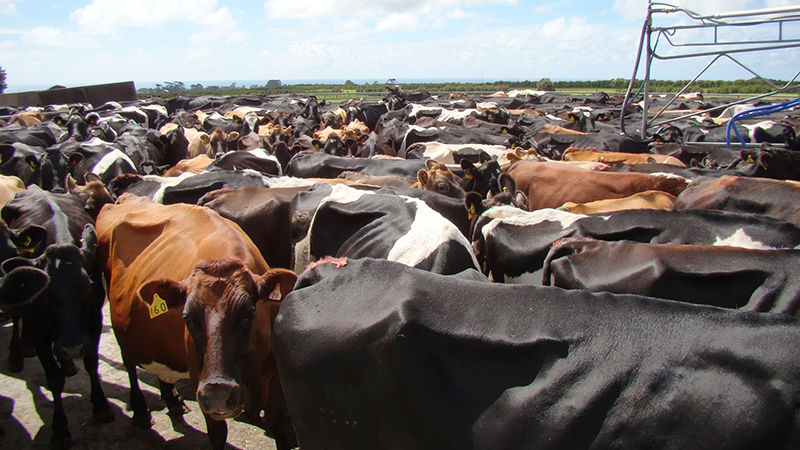 Cows stressed because of being packed too tightly. Cows with enough space to be relaxed. The dairy needs a good entry, exit and platform to ensure smooth access and no surprises. Inadequate space allowances e.g. the first bail in herringbones or an unsuitably angled head gate. Learn about cow behaviour to help you understand how the handling of cows can affect their willingness to enter the dairy. Observe cows during a milking to see if platform design, including pipework and layout, encourages good cow flow on entry and exit. The milk let down reflex stimulates milk flow from the alveoli in the udder into the teat canal. Useful information on how good lighting in the dairy is needed for safe, efficient operation and makes milking easier and more productive.